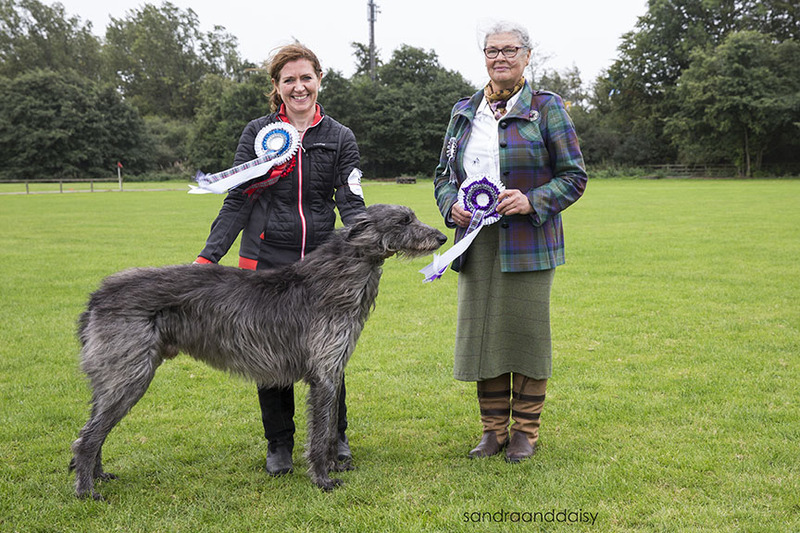 Congratulations to Wee Dram (Cusidh Drawing Down the Sun) who went Best in Show at the Northern Deerhound Club Limited Show in Sept '18. Thank you to our judge Helga Jansons (Nixophel) and to Sheila Sharp and Gordon and Alison Crossan who did such a great job organising the event. Wee Dram was the Top Puppy in Breed in 2013 and it's taken some time for him to mature and live up to that early promise. Now at 5 years old we think he's looking great and has really come into his own. He's a super dog to live with, really enjoying his runs in the Pentlands and play time with his partner in crime Styx (Brylach Over the Broomstick with Cusidh). Here's a photo of Wee Dram with Helga Jansons.